White Tara (Tibetan - Dolma Karmo or Dolkar) White Tara is always depicted as a peaceful deity. Her special function is to promote long life, both for the practitioner and for others. Ultimately, she is the very nature of the dharmakaya, and her practice is a means for attaining liberation. She is seen as is a beautiful loving mother figure, with a body that is the brilliant white of a thousand autumn moons. She seated in the vajra posture above a white moon disc and an open lotus. Her aura glows, as various colored rings framed with lotus blossoms surround her. Her garments are elaborately decorated with ornaments; on her head she wears a sparkling crown, crested by Buddha Amithaba himself; and she is adorned with beautiful jewelery - a long and a short necklace, as well as various gold and jewel ornaments. Her right hand rests across her knee in the mudra of supreme generosity, while her left hand holds near her heart the stem of a uptala flower, which is blossoming near her left ear. 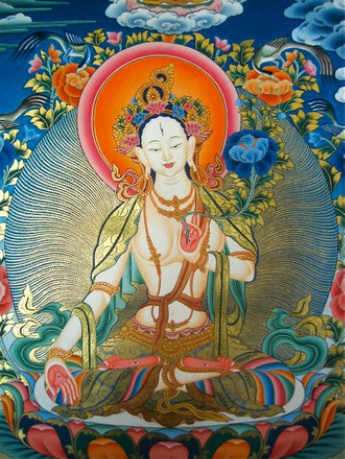 White Tara is always depicted as a peaceful deity. *In the Buddhist tradition, the spiritual teachings are offered for everyone's benefit without charge. The concept of dana, or reciprocity and generosity, is "practiced" by everyone to support the lama (teacher), nuns and monks who live entirely by donation. All expenses are paid for through the generosity of the Sangha. Your donation is greatly appreciated and its ripples are tenfold! Practice is held at 5337 Cullom Avenue in Chicago. 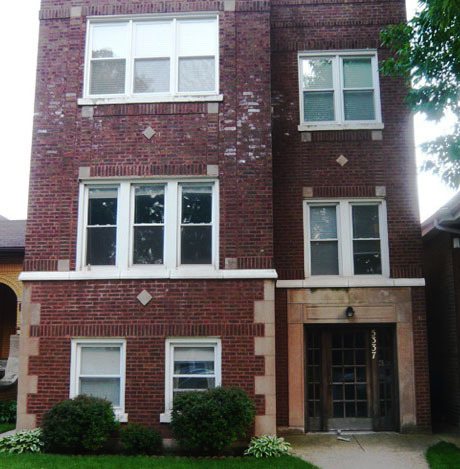 Our Center is located in a two-flat in the beautiful Portage Park neighborhood close to I-94. 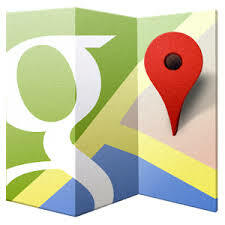 Click on Google icon to find us on the map!